Sqaure-Enix Teasing Space Title: New Star Ocean Project? The countdown is set to expire this Wednesday, December 12th. 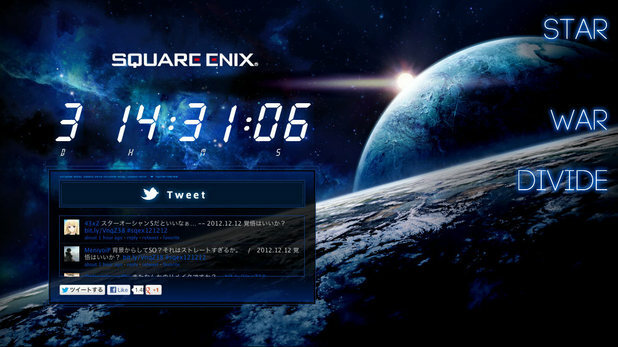 Square-Enix recently launched a new teaser site. A view overlooking a blue planet with a star on the horizon is shown, and the countdown is set to finish on December 12th at 3 AM, UK standard time. On the right, there are a few other word, “Star”, “War” and “Divide”. But considering the nature of the properties Square-Enix owns, is it possible a countdown to a brand new IP? Or maybe a sequel to the critically acclaimed Star Ocean franchise, which we last saw in 2009 with the Xbox 360’s Star Ocean: The Last Hope? The Star Ocean series was created by Yoshiharu Gotanda and tri-Ace, and takes a wildly different approaches to gameplay compared to Final Fantasy and Dragon Quest. Players can create their own items, and the gameplay is more action-oriented, akin to Namco-Bandai’s Tales series. It’s also one of the earlier examples of being able to alter the game’s outcome through the choices you make in the game. Whether this is a new Star Ocean or not remains to be seen. But considering the reception and acclaim that Star Ocean: The Last Hope received in Japan, it wouldn’t be one of their worst ideas (*cough*Lightning Returns*cough*).